GruppeM Intake for the Audi RS5 V8 System is the highest standard air product that complements and improves the look and feel of any RS5 engine. Call 714-582-3330 to order today! We also install. Feeling great is all about looking great and if you have an Audi RS5 you should know exactly how that feels. 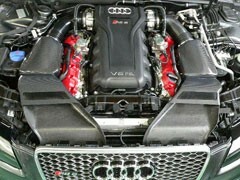 By adding the GruppeM intake to your Audi RS5 V8 that feeling is highly intensified. Lower intake air temperatures carry higher concentrations of oxygen, allowing for more energetic explosions and producing more horsepower and torque. GruppeM intake for the Audi RS5 V8 is replaced by heat-shielding carbon fiber with enhanced inlets to capture the maximum amount of air. Designed to make maximum power gains, the GruppeM intake for the Audi RS5 optimizes flow while still adding premium materials in their craft and design. GruppeM increase horsepower by ducting cooler, denser air into the engine and save weight over bulky factory systems by employing lightweight carbon fiber and other composite materials. They further engineer their systems to deliver an exotic and pleasing intake sound. GruppeM developed the highest standard products that include performance automotive brands including Ferrari, Lamborghini, Porsche and BMW. GruppeM philosophy of attention to detail includes product lines that include high performance exhaust systems, brake line systems, and carbon fiber aerodynamic elements. GruppeM produces products that include carbon fiber air induction systems, titanium exhaust systems, stainless steel break line systems, and aerodynamic parts. 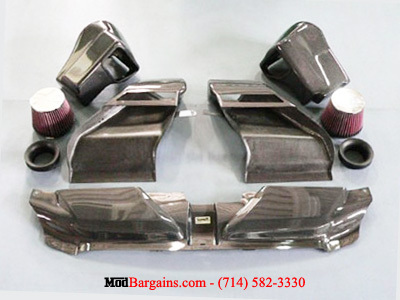 GruppeM products drastically improve the performance of your vehicle, for the best rates call Modbargains today at (714) 582-3330. Professional installation is recommended. 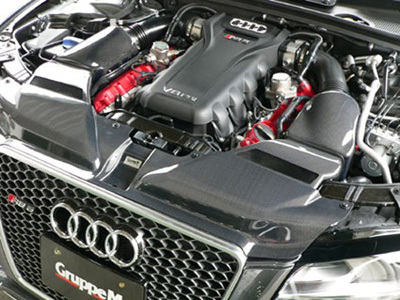 Get this GruppeM Audi RS5 V8 Intake System installed by our experts at ModBargains. Our experts are highly trained to perfect each install.